Having celebrated Onam, the festival of Kerala, in different parts of the UK over the last 30 years of its history, MAUK has now come to the realisation that it is time to share these cultural values and their universal relevance with the wider community in the UK, especially with the younger generation. MAUK strongly feels that the traditional stories that add to the richness of Onam and their various interpretations over the years have the potential to effectively complement the noble educational processes that inculcate these underlying human values in the younger generation. This realisation has spurred MAUK in to a cultural journey in partnership with Hartley School (in East London), to propagate these values to the wider community through the project “Our Story”. We are not just “another” community organisation, therefore we are looking for someone exceptional who can bring “Our Story” to life, engage with all sections of the community and has a “can do” approach. This is a high profile role that will open up your network with very senior public figures and enhance your skills. If you have passion and hunger, then contact us. To manage the aims of the Heritage Lottery funded ‘Our Story’ Project, with particular focus on the implementation of ‘Our Story’ Project Plan. To co-ordinate around 65 volunteers and motivate them to help deliver the project. 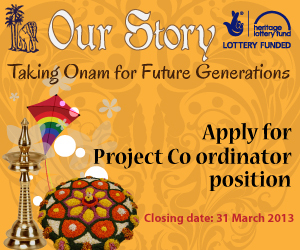 To co-ordinate a reminiscence project for Malayalee elders, exploring the importance of Onam through individual and group interviews. To co-ordinate group interviews with Malayalee youth about the relevance of the value and meaning of Onam in contemporary society. To co-ordinate the recording and editing of all interviews. Organise the production of an oral history booklet and accompanying DVD, and its subsequent dissemination throughout the local community. 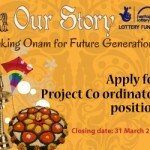 To co-ordinate the development of primary school learning resources based on the heritage, legends, rituals and customs of Onam in partnership with Hartley Primary School in Newham. To organise learning events for the wider adult community in east London. To co-ordinate the use of local, regional and specialist archives to find materials on Onam to underpin the above reminiscence and learning activities. To co-ordinate public access to ‘Our Story’ materials by making them downloadable for free on MAUK’s website. To co-ordinate the deposition of ‘Our Story’ project materials with appropriate archives to ensure conservation for future. To co-ordinate the commissioning of contractors. To manage the ‘Our Story’ project budget. To co-ordinate all necessary reports, including to Heritage Lottery Fund. If you wish to know more about the role, contact Balamurali Nair on 07720 424948 or balamuralinair@yahoo.co.uk. Closing Date to submit applications: 31thMarch 2013. Interviews will be held on 27thApril 2013 (Saturday). We are hoping that the successful candidate will be available on 26th May 2013 when the project will be launched at Ilford Town Hall.